JBL OnBeat Xtreme review | What Hi-Fi? If you’re forking out £500 for an iPod dock, you expect a certain standard of build, finish and features. 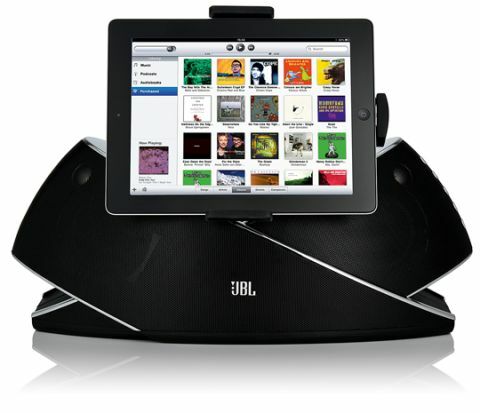 JBL does the job nicely here with its Bluetooth-enabled OnBeat Xtreme dock. Sporting twin mid/bass drivers and tweeters in a quirky ‘crossed-arms’ enclosure, it’s an eye-catching affair – and thankfully it doesn’t feel plasticky or cheap. That goes for the well laid-out remote control, too. Docking our iPod Touch into the supplied (sadly rather fiddly and flimsy) rotating clamp, we got the ball rolling with a blast of Chan Chan by the Buena Vista Social Club. There’s certainly no shortage of low-frequency heft here – impressive, given the OnBeat’s relatively small drivers. The detail present in the sweet midrange and treble is rarely swamped by this, though; if anything the midrange could do with a little tempering at higher volumes. Individual instruments are given plenty of breathing space, although vocals sometimes sound a little damped when the going gets really complicated. Dynamics are handled with no alarms, though, and there’s plenty of scope to go loud should you fancy a little neighbour-baiting. Uncouple your source and pair it with the OnBeat via Bluetooth (a quick, painless task) and results are decent given the constraints of the technology. There’s a little hiss and a slight drop in clarity, but it’s certainly nothing worth complaining about too much. You can even make and receive phone-calls via the dock’s built-in microphone. Sound quality here is fine, and voices are picked up well for the person on the other end.